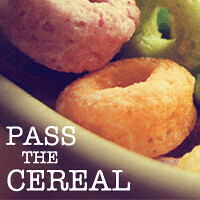 Pass the Cereal: There's an app for that! Recently (not really), I posted about beginning a recipe book project (still not started) and asked for your advice. You guys had so many great suggestions, but I was most intrigued by my friend Angie's suggestion to check out an app called Pepperplate (and yet I still didn't do it). Then Angie's hubby Jamie (who is also my friend and super smart just like his wife) tweeted that he was heading to the grocery store using the shopping list function of Pepperplate...again intrigued (but still no actual checking out the app). And then, Pepperplate sent me a tweet asking if I liked the app...it was clearly time to get busy. I downloaded the free app and typed in a few recipes (easily done via the web or app). I asked (via twitter) if it is possible to print my recipes (for when I finally make that binder) and got a response right away that I could...yay! As I cooked for the family, I'd enter those recipes and I thought it was pretty cool to have such fancy versions of my recipes (most of my paper versions have not held up well as I tend to make a mess when I cook). It was all good, but I wasn't sure how long Pepperplate and I were going to be dating. But then one day...I fell in love! It was a morning like any other...I had arrived at the grocery store with a 2-year-old, no list and not much food back at our house. I had to get the basics and I really needed to plan out some dinner options too. Usually this means I buy any meals that I can remember the ingredients too (you know exciting options like pizza, quesadillas and breakfast for dinner), but not this time. I had our favorite recipes in my phone (the app syncs between all your devices & your web account), so I menu-planned in the car. It's as simple as picking a recipe and clicking the Add to Shopping List button. You have the option to scale the recipe and the quantities are adjusted on your shopping list (super helpful if you're cooking for a crowd). Once you've added all your recipes, your list appears with ingredients listed by aisle. You can mark items you already have (I marked off the spices right away), add additional items (milk and Diet Coke), and easily edit in which aisles items are listed. You mark off items as you shop just as you would on a paper list, but this way your list actually gets smaller as you go. That trip was awesome! Honestly, even if I don't use the shopping list option, it is incredible to have my recipes at hand. I don't have to try to keep all the ingredients and quantities in my head, because I can always look them up. I've also referenced my Pepperplate recipes in the kitchen and there is a multi-timer option I haven't taken advantage of yet, but I think it would be a wonderful addition to pulling together a big event like Thanksgiving dinner. I just need to find a spill-proof easel or hanger to make it safe for my ipad to join me in the kitchen! This post contains my own opinion of (and love for) Pepperplate. It is not a sponsored post. Sounds like I'm going to have to check that out! So glad this has worked out for you! We don't have one of those fancy pants phones like you do but this app really makes me want one! 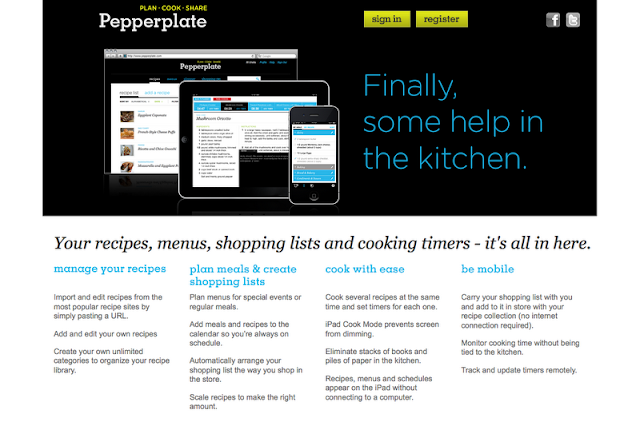 We do have an iPad and I love how Pepperplate keeps the screen lit as you cook. You should totally pass this post on to Pepperplate .. it is really well done!